A Kimberwick, or as it’s called in some places, a Kimblewick, is a common bit used in English riding and driving. It’s often seen on ponies with young riders who might struggle to control a pony in a simple snaffle bit. Because of its leverage action, it’s not used in some Pony Club events and dressage, but because it can provide a bit more 'whoa,' many people like it for trail riding for the additional control it can exert on a horse that might be a little more strong outside of the ring or arena. Of course, the severity of any bit often has more to do with how it is used than how much leverage or other action it has. Its use is sometimes controversial, as with any bit that is more severe due to leverage. Both the names Kimberwick and Kimblewick refer to the same bit, but the Uxeter type of either is a variation, with a slightly different action when the reins are pulled. The bit is named after the town, Kimblewick in Britain, where it first was introduced. You might not be able to show your horse in this bit, so check the show rules before arriving. The mouthpiece of the Kimberwick terminates at the top of ‘D’ shaped rings, with the rings of the Uxeter Kimberwick having slots in them. Kimberwicks can have a straight, jointed, or even a twisted mouthpiece with or without a port. There is a small ring to attach the curb strap or chain. A Kimblewick should always be used with a curb strap or chain to prevent the bit rotating back too far in the horse's mouth. The mouthpiece may be of copper, synthetic or other metal and it can be jointed or solid. As mentioned above, the Kimberwick is a curb, or leverage, bit. The further the reins slide down the D ring, the more leverage is applied. On the Uxeter Kimblewick, the reins can be attached through the slots to keep them from sliding. If the reins are placed in the lower slot, the bit will have more curb action than the upper slot. If the rider holds their hands a bit higher, the reins will stay high on the rings of bits with no slots in the rings. Lowering the hands will cause the reins to slide down the ring, and cause more curb action. With either type of Kimberwick, the curb chain or strap prevents the bit from rotating too far in the horse’s mouth. When the reins are pulled back, the bit applies pressure to the bars of the mouth, the chin, and the poll. If there is a port, there may be pressure on the roof of the mouth. Because the bit has the equivalent of very short shanks, the curb action is relatively mild. 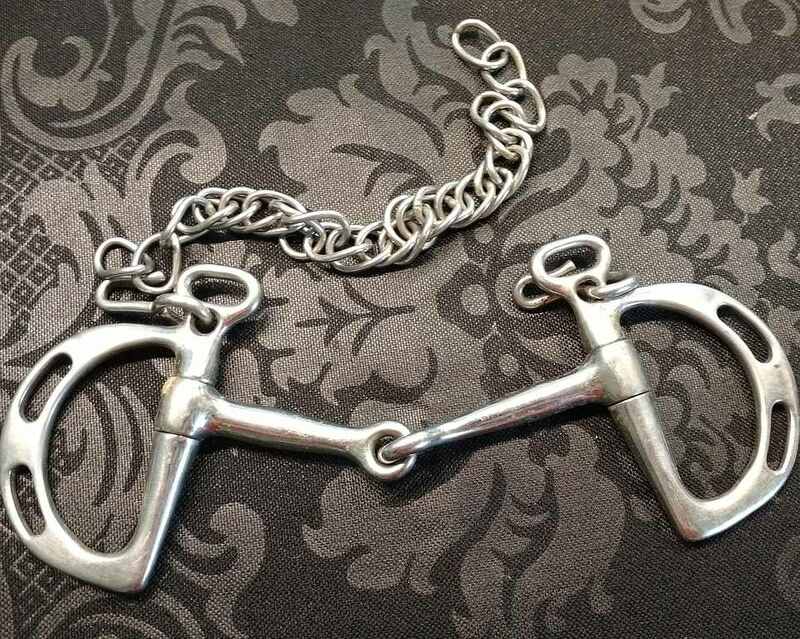 Ideally, every horse should be ridden in a plain snaffle bit. But, this doesn’t always happen due to rider skill, the horse’s training, and behavior, or personal preference. A kimberwick may be a bit to try before trying something with even stronger leverage action like a pelham or other curb bit. The Uxeter Kimberwick gives the rider the option to increase or decrease the amount of leverage the bit will provide when the reins are pulled because there is a choice of two positions to attach the reins to. Compared to a Liverpool bit, used in driving, this bit will have less leverage, as the ‘shank’ is quite a bit shorter. Many people don't recognize it as a curb or leverage bit, because the rings don't look like the shanks on a curb bit. With a plain Kimberwick, the action is more like a simple snaffle, as long as the horse or pony does not pull, and the rider's hands are light. If the horse does resist the rein aid, the leverage action comes into play. This is a bit commonly used in general riding and provides more curb action to a horse that may be a strong puller or needs slight curb action to lower its head. It can not be used in dressage and many hunter classes, although you may see it on field hunters. For trail riding, it may be useful or in any situation where a curb bit might be handy, but the shanks of a traditional curb bit might get caught up in things. It is occasionally used for driving. It is quite common to see ponies wearing these bits. This is a bit commonly used in general riding and provides more control on a horse that may be a strong puller or needs slight curb action to lower its head. It's a popular choice for young riders on ponies who might not be very responsive to the rein aids.